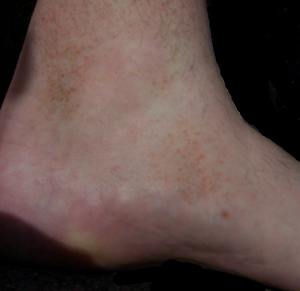 Rust-colored spots typical of Schamberg disease on the lower left leg and left foot of a 26-year-old Caucasian male. Schamberg's disease, (also known as "progressive pigmentary dermatosis of Schamberg", "purpura pigmentosa progressiva" (PPP), and "Schamberg's purpura") is a chronic discoloration of the skin found in people of all ages, usually affecting the legs. It slowly spreads throughout the body, and is most common in males. :829 It is named after Jay Frank Schamberg, who described it in 1901. There is no known cure for this disease and it is not a life-threatening condition. The skin lesions may cause itching, which can be treated by applying cortisone cream. The cortisone cream will only help with the itching and the discoloration of the skin will remain, which may cause a cosmetic concern in the future. Schamberg's disease is usually asymptomatic meaning that it shows no signs of this condition, except for the discoloration of the skin. This condition is caused by leaky blood vessels, where red blood cells escape near the surface of skin and release iron into the surrounding tissue. The cause of the leaky capillaries is unknown. The lesions are most frequent on the lower limbs, but may occur anywhere on the body, including the hands, arms, torso and even the neck. They may vary in number and erupt in mass numbers. They consist of irregular patches of orange or brown pigmentation with characteristic "cayenne pepper" spots appearing within and at the edge of old lesions. There are usually no symptoms, although there may be some slight itching, but there is no pain. The eruption may persist for many years. The pattern of the eruption changes, with slow extension and often some clearing of the original lesions. Schamberg's disease, or progressive pigmented purpuric dermatosis, is a chronic discoloration of the skin which usually affects the legs and often spreads slowly. This disease is more common in males and may occur at any age from childhood onward. This condition is observed worldwide and has nothing to do with race or ethnic background. Schamberg's disease is caused by leaky blood vessels near the surface of the skin, capillaries, which allow red blood cells to slip through into the skin. The red blood cells in the skin then fall apart and release their iron, which is released from hemoglobin. The iron causes a rust color and this accounts for the orange tint of the rash that can be seen on the skin. The underlying cause of the leaky blood vessels is not known, but researchers are suggesting that there could be some potential triggers. Some possible triggers include viral infection, a hypersensitivity to some agent, and interaction of some medications, such as thiamine and aspirin. Even though there is no correlation with genetics, there have been a few cases where few people in a family had this condition. Although the cause of capillary inflammation is unknown, certain preventive measures can be taken. Doctors may prescribe medications that enhance the circulation of blood, which can keep blood vessels strong and healthy. Schamberg's disease is a skin disorder that causes a discoloration of the lower extremities. It manifests in the lower extremities and it gradually moves up towards anywhere on the body. This condition is caused by leaky blood vessels near the surface of the skin. The cause of the leaky capillaries is still unknown, but it is responsible for the discoloration of the skin. Since the blood vessels are weakened, red blood cells escape the blood vessels, where they end up near the surface of the skin. In one molecule of hemoglobin, there are four heme groups and each heme group contains one iron atom. Iron is responsible for helping red blood cells transfer oxygen from the lungs to the cells and carry carbon dioxide from the cells to the lungs. When red blood cells escape the blood vessels, red blood cells break apart, releasing hemoglobin. As the hemoglobin has nowhere to go and cannot be reabsorbed back into the blood, it will break apart. Iron is released from hemoglobin and deposited into the skin. The iron complex hemosiderin is responsible for the discoloration of the skin, which creates patches of orange and brown pigmentation. With a complete history, the results from visual examination, and the aid of appropriate laboratory testing, a dermatologist can usually determine whether the skin lesions are in fact due Schamberg's disease. Schamberg's disease can only be properly diagnosed by a healthcare provider. For a trained skin specialist such as a dermatologist, the condition is often readily diagnosed, because the visual appearance of the lesions on the skin itself usually suggests the possibility that the cause may be Schamberg's disease. While reviewing medical history is important to diagnose this condition, it is essential that the purpuric lesions be physically examined. To ensure that the skin lesions are not caused by other skin conditions or infections, a doctor will often order a complete blood count (CBC) and other blood tests. Blood test results are usually normal. They are performed primarily to rule out other bleeding disorders that cause purpura. Since Schamberg's disease is usually asymptomatic beyond the visible lesions themselves, few other tests are usually indicated. Additional testing may aid diagnosis. A skin biopsy may be taken to determine capillaritis of dermal vessels. Capillaritis or pigmented purpura is skin condition that has brown-reddish patches on the skin, which is caused by leaky capillaries. Such skin biopsies are sent to a laboratory for a pathological examination, where each biopsy is observed under a microscope. A dermatologists may also perform a dermatoscopy. There is no cure for Schamberg's disease; however, the itching can be controlled by a cortisone cream, and Colchicine treatment has been successfully used to prevent recurrence of the symptoms. This condition is not life-threatening or a major health concern. The only problem that patients will encounter is the itching and discoloration of the skin. It is recommended that patients take a vitamin C supplement to promote collagen production, which will help make the skin look and feel healthier. To prevent further irritation of the lesions, patients should avoid food with artificial colors and preservatives. Some people can be allergic to preservatives, which can cause the body to initiate an allergic reaction by further irritating those lesions. Several research studies have indicated that Schamberg's disease can be controlled and the number of lesions can be reduced with use a drug called aminaphtone. This drug helps improve capillary fragility and it prevents and controls the purpuric lesions. A patient with Schamberg's disease can live a normal and healthy life. Since there is no proven cure for this condition, the patient will have to endure the lesions on his or her skin. With appropriate treatments, the condition may get better. Although the skin lesions are not life-threatening, it may cause a cosmetic concern for some individuals. Skin lesions may cause psychological discomfort, where patients may require reassurance to help with stress and anxiety. There are a few rare cases of T-cell lymphoma that have developed from Schamberg's disease. This is not a cause for concern, since the risk factors associated with Schamberg's disease are relatively low. A few very small non-blinded studies of treatment with narrow-band ultraviolet light have been reported as promising. ^ a b c d e f g h i j "Schamberg Disease". DoveMed. Retrieved 2017-11-05. ^ a b c "Causes Of Schamberg's Disease: Symptoms, Diagnosis & Treatment". www.tandurust.com. Retrieved 2017-11-05. ^ a b c "What is Schamberg's Disease? - Skin Site". Skin Site. Retrieved 2017-11-05. ^ a b "Schamberg's Disease Treatment - Home Remedies for Schamberg's Disease". www.best-home-remedies.com. Retrieved 2017-11-06. ^ a b c d e f g h "Progressive Pigmentary Purpura - American Osteopathic College of Dermatology (AOCD)". www.aocd.org. Retrieved 2017-11-07. ^ a b "Schamberg's Disease. Read About Schamberg's Disease". patient.info. Retrieved 2017-11-06. ^ "Capillaritis | DermNet New Zealand". www.dermnetnz.org. Retrieved 2017-11-07. ^ a b "How to get rid of Schamberg's Disease | Chronic Lesions on Legs". www.depression-guide.com. Retrieved 2017-11-06. ^ a b de Godoy, José Maria Pereira; Batigália, Fernando (2009-06-11). "Aminaphtone in the control of Schamberg's disease". Thrombosis Journal. 7: 8. doi:10.1186/1477-9560-7-8. ISSN 1477-9560. PMC 2703626. PMID 19515261. This page was last edited on 19 March 2019, at 11:23 (UTC).